According to @Fight_Ghost on Twitter, this is the $40,870,000 check Floyd Mayweather Jr. got for fighting Saul “Canelo” Alvarez. This is after $630,000 was taken out for tickets and anti-doping tests. Just a reminder, this does not include the money Mayweather will earn from the pay-per-view numbers. They don’t call him “Money” for nothing. Here is a Extreme Rare, Investment piece, “The only one in the World” Included in this Extreme piece is a beautiful signed and dated Cut, The 70th Birthday Invite, The pen used in Ali signing the night of his 70th Birthday, The actual menu of the event, and best of all the Butterfly and the Bee right off Muhammad Ali’s Birthday cake, and photo’s included of the event. OUR PRICE FOR SERIOUS INVESTERS ONLY CONTACT ME…. MUST HAVE! EVERY AUCTION HOUSE WANTS THIS IN THERE CATALOGS! 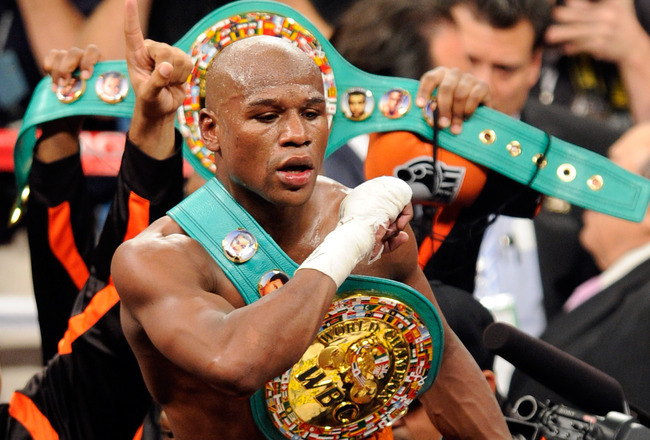 Floyd Mayweather is just one of many popular boxers who have emerged from the sport. Through various routes—some through the ring, some outside it or a combination of both—these boxers connect with the people. Whether they make people hate them or love them dearly, they make people care about what they do and how they do it and that is what matters most. Floyd Mayweather Jr.’s masterful win over Canelo Alvarez is almost ruined by judge C.J. Ross. It was a near flawless effort, in and out of the ring. Floyd Mayweather Jr. put forth a virtuoso performance against the less experienced Saul (Canelo) Alvarez on Saturday, hitting and not getting hit. But it wasn’t just Mayweather’s treatment of Alvarez that was so notable. Golden Boy Promotions orchestrated one of the more ambitious and successful advertising campaigns for the fight, giving fans a hint of what the future of the sport could one day hold. But just as boxing took a step forward, it was dragged back into its murky past when the judge’s scorecards were announced on Saturday at the MGM Grand. 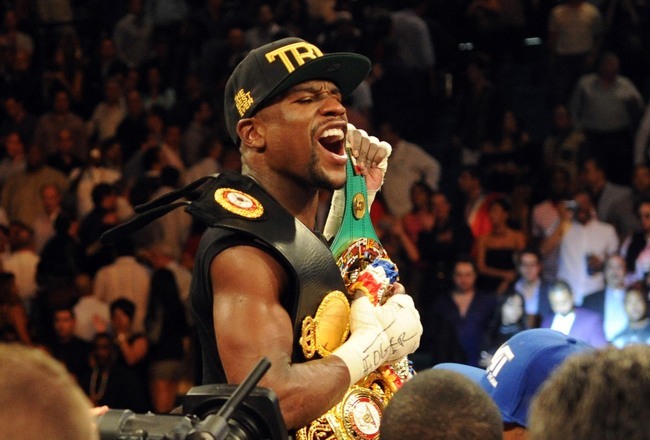 Only two of the three judges acknowledged Mayweather’s dominance, with C.J. Ross, a scorer with a checkered past, the lone dissenter. Floyd Mayweather Jr. and Justin Bieber can’t believe what they’re hearing when C.J. Ross’ scorecard is announced. Ross scored the fight a draw at 114-114, deciding that Mayweather, 36, had only won six of the 12 rounds. The other two judges scored it for Mayweather: 116-112 (Dave Moretti) and 117-111 (Craig Metcalfe), giving the Pound-for-Pound King a majority decision victory. When Mayweather (45-0, 26 knockouts) heard the verdict in the ring, he thought someone was pulling his leg. Even Justin Bieber, who walked Mayweather to the ring beforehand, looked upset. Ross scored four of the final five rounds for Alvarez. Judge C.J. Ross (r.) originally raises suspicions during the Timothy Bradley-Manny Pacquiao fight. On a night when the public was finally turning its attention to a sport that has mostly lived on the margins, fans got a taste of why so many have turned their backs on it in recent years: because of the head-scratching decisions by either corrupt or incompetent judges that continue to mar big fights. Floyd Mayweather Jr. puts on a boxing clinic against Canelo Alvarez. “The judge C.J. Ross should be investigated had some money on the fight” Nets point guard Deron Williams posted on his Twitter account. Many wondered aloud how Ross got the assignment to judge the biggest fight of the year. Ross is the same judge that awarded a controversial split decision victory to Timothy Bradley against Manny Pacquiao last year when most observers thought Pacquiao did enough to win. In most sports, it’s the best officials who get to referee the most important events, based on their previous performances. But that doesn’t always happen in boxing, said Showtime boxing chief, Stephen Espinoza. No one from the Nevada State Athletic Commission was immediately available for comment after the fight. Schaefer suggested the Nevada commission use the money it made on the fight on seminars to better educate judges. The fight set an all-time live gate record of $20,003,150 on Saturday. 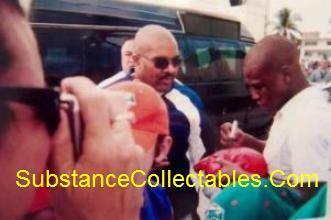 For your piece of Boxing History go to www.substancecollectables.com for you favorite boxers memorabilia. 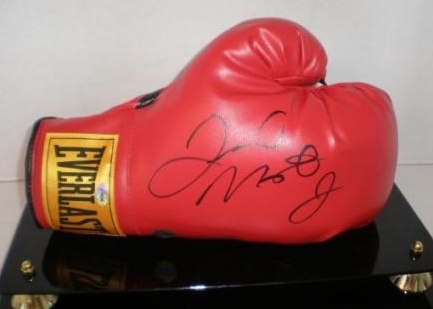 Floyd Mayweather Jr. Boxing memorabilia sale. MANILA, Philippines – Filipino boxer Manny “Pacman” Pacquiao has revealed only a few details need to be ironed out regarding his possible mega-fight against American fighter Floyd Mayweather Jr.
Pacquiao recently confirmed that negotiations are ongoing with Mayweather’s team. Mayweather also called on Pacquiao to sign a contract for a May 5 fight date. Pacquiao said there are only a few details left to be tackled in the negotiations. He said he has no issue with the May 5 fight date, saying it is a good month for the fight. Pacquiao also laughed off Mayweather’s recent comments about him, wherein the American boxer said Pacquiao actually has 6 losses on his record instead of 3. Mayweather said Pacquiao lost to Mexico’s Juan Manuel Marquez three times, bringing his total number of losses to six. “Kung ganyan ang paniniwala n’ya, eh di respetuhin natin,” Pacquiao said. (If that’s what he thinks, we have to respect it). The fighting congressman from Sarangani is planning to watch the friendly match between the Philippine Azkals and the Los Angeles Galaxy on Saturday at the Rizal Memorial Stadium along with his wife and kids. PHILADELPHIA — With his championship belt and a pair of gloves draped over his casket, Joe Frazier was going one more round. The Rev. Jesse Jackson asked mourners to rise, put their hands together and for one last time “show your love” for the former heavyweight champion. Wearing a dark suit and sunglasses, a frail and trembling Ali rose from his seat and vigorously clapped for “Smokin’ Joe,” the fighter who handed Ali his first loss. Ali was among the nearly 4,000 people who packed the Enon Tabernacle Baptist Church for a two-hour “joyful celebration” of Frazier’s life. He died last week of liver cancer; he was 67. Also attending were former heavyweight champion Larry Holmes and promoter Don King. His body ravaged by Parkinson’s disease, Ali was accompanied by members of his family and wife, Lonnie, who rubbed his back while he was seated and held his hands as he entered and left the church. Mike Tyson, a catch in his voice, sent a videotaped message of condolence as did real estate magnate Donald Trump and actor Mickey Rourke. Fellow Philadelphia fighter, longtime middleweight champion Bernard Hopkins, also attended. The Rev. Al Sharpton was forced to cancel Monday morning. King, wearing an U.S. flag scarf and clutching a mini-flag, walked over to shake Ali’s hand before the funeral; Holmes greeted “The Greatest” when the service ended — with a 10-bell salute, boxing’s traditional 10-count farewell to its own. Thousands of mourners turned out Friday and Saturday for a public memorial viewing at the Wells Fargo Center. Frazier beat Ali, knocking him down and taking a decision in the Fight of the Century at Madison Square Garden in 1971. He would go on to lose two more fights to Ali, including the “Thrilla in Manila” bout. Frazier was embittered for years by Ali’s taunts and name-calling, though he recently said he had forgiven him. Their epic trilogy was recalled not only by speakers at the service but those who sent letters to be read at the ceremony. Rourke got the biggest laugh when he joked about Ali getting knocked down by Frazier — with Ali’s friends and family laughing the loudest. Smokin’ Joe was a small yet ferocious fighter who smothered his opponents with punches, including the devastating left hook he used to end many of his fights early. That’s what he used to drop Ali in the 15th round of their epic bout at MSG. While that fight is celebrated in boxing lore, Ali and Frazier put on an even better show in their third fight, held in a sweltering arena in Manila as part of Ali’s world tour of fights in 1975. Nearly blinded by Ali’s punches, Frazier still wanted to go out for the 15th round, but was held back by trainer Eddie Futch. The bout, Ali would later say, was the closest thing to death he could imagine. Frazier won the heavyweight title in 1970 by stopping Jimmy Ellis in the fifth round of their fight at Madison Square Garden. Frazier defended it successfully four times before George Foreman knocked him down six times in the first two rounds to take the title from him in 1973. Frazier would never be heavyweight champion again.